Reign Over Me has some good traits, and it’s easy to point them out. What’s harder to illustrate in a review is the emotional blandness of the movie that could put passive audiences to sleep. Sandler has a limited range: he always plays a boy trapped in the body of a man — whether for laughs (as in his comedies) or for drama, as in Punch-Drunk Love. Here, he plays it for pity and sympathy, and he’s actually pretty well cast for the part. Enter Alan (Cheadle), Charlie’s roommate from dental school. Cheadle lives comfortably with his extended family in New York City. One day he sees Charlie, disheveled and hollow, and he tries to rekindle their friendship and to find out how Charlie managed to fall into his current state. Another thing Reign Over Me does well is to portray Charlie’s grief and coping. Charlie is no longer a complete man, which is well within Sandler’s range. When the going gets tough, Charlie puts on his headphones and blasts Quadrophenia to tune out reality. Settlement money means that Charlie can afford his mental illness; he can afford to spend all day playing big-screen video games and to obsessively remodel his kitchen without his landlord kicking him out onto the streets. 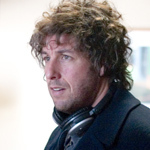 As important as Sandler’s sympathetic performance is writer/director Mike Binder’s observant writing (he also wrote and directed The Upside of Anger in 2005). How Charlie copes seems entirely plausible. What also rings true is what it takes to get through to Charlie. Much of the movie involves attempts by friends, well-wishers, and psychologists to help Charlie. And while each of the quick solutions fails, Alan, simply by spending the entire movie with Charlie, is able to make some headway. It is his mere presence — it is time and loyalty rather than any trick or particular effort — that counts. I wanted to like the movie for its complexity, too, but those expectations were soon dashed. I had high hopes after the early scene where Alan is stalked by a mentally ill woman who feels “strangely intimate” towards him. At that point, she didn’t have an obvious place in the plot, so I had hoped she would be a counterpoint to the main relationship between Charlie and Alan. Her inappropriate feelings of connection raised questions on the nature of intimacy and friendship. Can you build a relationship suddenly and on-demand? If you could, would that be enough to help someone like Charlie? Or is it neurotic to try to demand intimacy with someone on the spur of the moment? Her place in the plot soon becomes more mundane, however. And anyway, it’s impossible to take the movie very seriously. Rich metaphors don’t mesh with the cheap laughs and string-pulling melodrama that the movie ultimately offers its audience. The events of 9/11 are also too heavy to belong, and so is another thing that Charlie does toward the film’s climax. The moments of serious drama are undermined by the overall light tone of the film. Reign Over Me would have been a better film had it gone one way or the other. The movie’s ambivalence may explain its lack of engagement with an audience. Though my audience chuckled at all the right places and fell silent at the dramatic points, there was a definite lack of excitement and energy, as though all of us were willing to become engaged, but none of us were completely sucked in. The movie opens cautiously, introducing us to the characters, but it never grabs us. We wait for something that will make us love these people. We even wait for the movie to tell us whether it’s a comedy, a light drama, or something more serious. Instead, we’re left to fend for ourselves. That’s something a demanding art-house movie can get away with, but for Reign Over Me, it’s just a sign of confusion and ambivalence. So the movie has a good heart, and does some things very well. But the overall impression audiences are likely to get is that it’s just another lightweight drama, with nothing exciting enough to make it memorable. Edge: I do agree with most of what you said here except for two things. #1 is that the use of the 9/11 incident I think is important mostly because it shows how relentless the terrorists are that they will sacrifice women and children in order to accomplish their goal. #2 is that this movie was in no way emotionally bland. As you said they portrayed the way that Charlie was coping with his loss. There really are people like that and this movie helps you to feel the emotional stress/trama that they've been through and are still trying to deal with. Sharon: Alright. I just have to put my 2 cents in. I don't care of this movie came out two years ago or not. #1.) I really thing the fans on this movie are 50 / 50 - either they see it and they can just really relate, or they see Adam Sandler playing yet another immature role in a movie that just doesn't seem to make much sense. You either get it, or you don't. However, to call this movie emotionally bland is just a poor choice of words. It has many ups and downs and had me tearing up and laughing at the same time. I think the well added jokes were brilliant - I don't believe that some good laughs takes away from the movie's original intention at all. #2.) I don't believe that the fact this story used 9/11 took away from the movie at all. It doesn't even have enough presence in the movie other than to explain why he can do whatever the hell he wants. The fact is, being that this movie was made after 9/11 and it's about a plane crash, it wouldn't have mattered if they had come out right and said it or not - we'd still be saying, "oh, he's just using a plane crash scenario because of 9/11 and he was just too much of a puss to come out and say it." It's there, and it's in no shape or form used as a driving plot force. No, it's not a message about the horrors of terroris. It may in some form be a way of showing how it has affected the victims of 9/11, but I think the movie's message was broader than that in terms with grief and coping.